That's why it's been so long since I posted. Ok fine I haven't really been drinking, I've actually not been drinking. I had to wear a corset in a recent film shoot and decided to go all healthy for a month in prep. Then I shot the film, then St. Paddy's day arrived, then I made cupcakes with Guinness in them. And oh lordy do I love me some good beer. So then I started drinking. And baking. And those two things should always be combined, as long as you make sure to stay safe around your preheated oven. So...Guinness Cake. Shutup it's one of the best things I've ever tasted. I have a couple of "actually Irish" friends, aka friends actually born in Ireland, not just of Irish descent, and one of them introduced me to this glorious dessert. Be ready to become the most popular person at your next Irish/beer/whatever-themed gathering. This cake has a great chocolate kick to it, and the flavor of the Guinness comes through beautifully. Get Ready, Get Set, Drink! 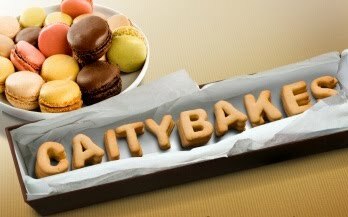 I mean, Bake! 1. Preheat oven to 350 Degrees Fahrenheit. Prep muffin tins with liners (makes 24 cupcakes). 2. 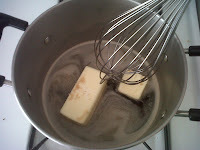 Heat 1 Cup Guinness and butter in a large saucepan over medium-low heat until butter melts. Remove from heat. Add cocoa and sugar and whisk until smooth. 3. In a bowl, combine sour cream, eggs and vanilla. Add to Guinness mixture. Add flour and baking soda and whisk until smooth. Pour batter into prepared muffin tins. 4. 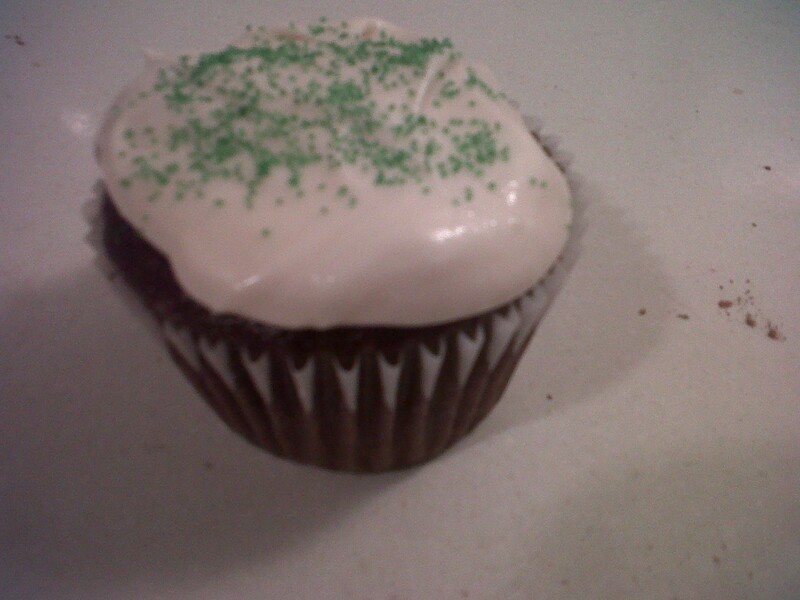 Bake at 350 for 20-25 minutes, until a toothpick inserted in center of cupcake comes out clean. Cool for 5 minutes in pan, then remove to cooling racks and cool completely before frosting. 5. 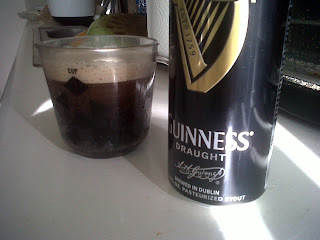 Whip cream cheese, powdered sugar and Guinness on high until smooth. Add more Guinness to taste. 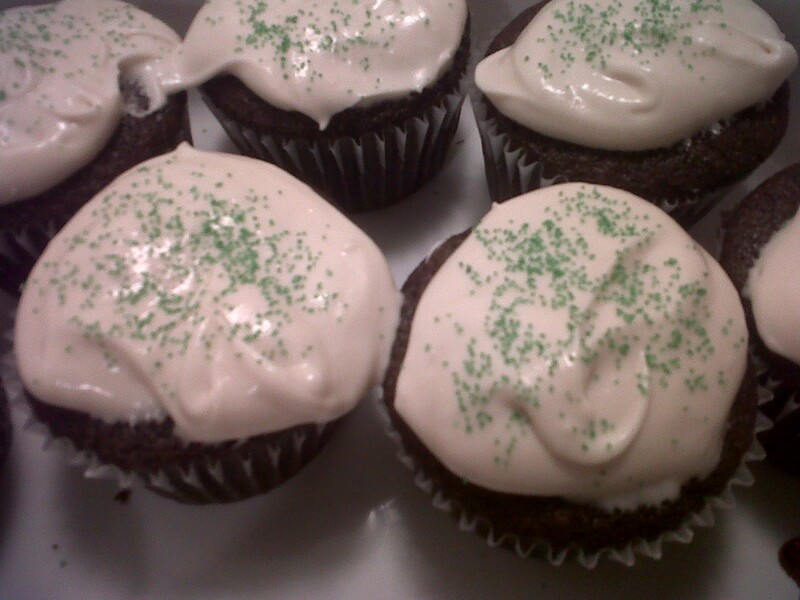 If frosting gets too thin, add a bit more powdered sugar. Frost your cupcakes and eat! Or sprinkle with festive green sprinkles and then eat! Anybody wanna buy me a new camera so these pics can look fabulous instead of pixelated? You do? Awesome. Thanks. You won't regret it. Hey! I've been in a baking/cooking frenzy since I very recently got a Kitchen Aid Stand Mixer as a wedding gift. I saw your blog and this guiness cupcake recipe through facebook and realized that I have everything in my kitchen to make them, except my guiness is extra stout. Do you know if the extra stout will make a difference?